What are piles of beer cans, cups, bottles, food wrappers and bags? Things you'd like to recycle? Things that everyone has their hands on every day? Yes. Yes. And no. We find piles of beer cans, cups, bottles, food wrappers, bags and more on the bottom of our ocean, lakes and rivers all the time. In fact, our urban harbors are covered in this trash - we've found concentrations as high as 41 million pieces of trash per square kilometer! This carpet of trash is not doing any good for the amazing and important creatures that call the bottom of our urban harbors home. It smothers their habitat, it introduces pollutants into the food web and it is not going anywhere very fast. 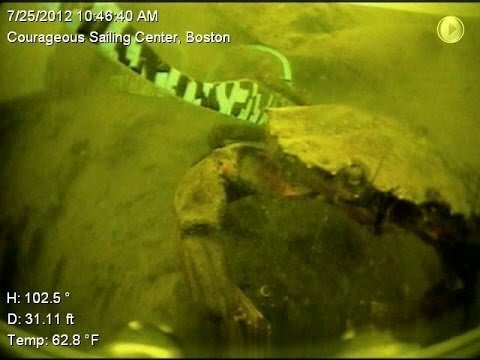 The crab in this video was hanging out on a pair of sunglasses when Rozalia Project's remotely operated vehicle, Hector the Collector, happened across the scene during a harbor floor cleanup and education program with young sailors from Courageous Sailing in Boston Harbor. It turns out that the sister of the girl who lost the glasses two weeks before was with us (and jumping up and down at their discovery). 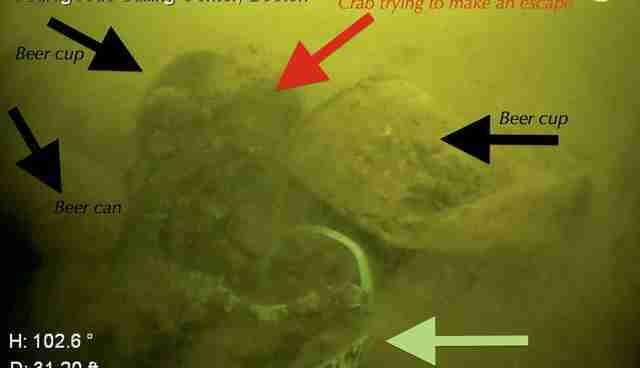 Our job is to protect the ocean and that includes cleaning it up so while we strategized about how to pick the glasses up, the crab had a very close look at us by climbing up on the ROV's gripper. He clearly was not interested in Hector and turned to make his getaway. But in order to escape, he had to literally fight his way past beer holders, cups and cans. We are happy to say that, in the end, the crab was fine, we got the glasses to their owner and we went back and cleaned up that pile of trash (and others). 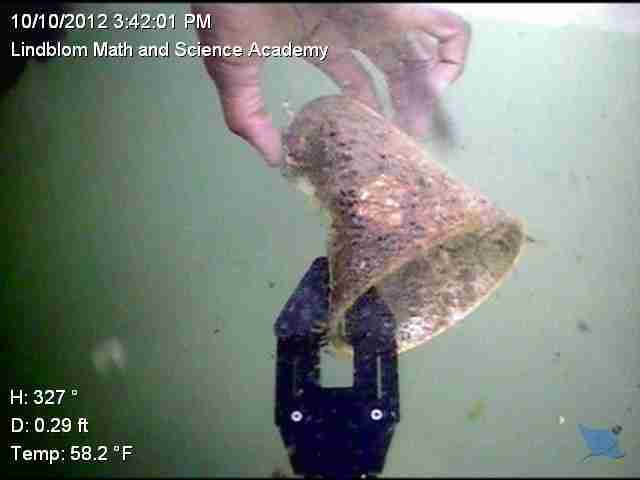 In addition, we continue to work toward a clean ocean - in urban and coastal waters all over the country (below shows our ROV handing off a plastic cup from the bottom of Chicago's Burnham Harbor) by cleaning up surface to seafloor and working to prevent trash from getting in the water in the first place. You can be part of the solution as well. Reduce the packaging you use, recycle everything you possibly can, encourage your municipalities to provide covered, paired trash and recycling bins throughout your local parks and along the water and know that every effort will make a difference!